For over a year, Chikara Ono has been plotting a Swan’s Market offshoot to B-Dama (4301 Piedmont Ave., Oakland), Ono’s casual izakaya — a favorite among local chefs as well as Japanese expats — but up until now details about the new Old Oakland spot have been scarce. Although the project still doesn’t have an opening date, or even a name, Ono said he does have a pretty good idea of what the new spot might serve: rice bowls. On Wednesday, October 9, B-Dama will launch lunch service for the first time, with a rice-bowl-centric menu that will serve as a kind of test run for the new restaurant — “practice,” as Ono put it. According to Shin Okamoto — who will helm the kitchen at the as-yet-unnamed Swan’s Market restaurant, along with fellow B-Dama cook Asuka Nadeshiko — the rice bowls will fall somewhere between traditional Japanese food, street food, and fast food. They’ll be somewhat similar to donburi, the Japanese term for rice bowl dishes that function as “one-bowl meals”: meat, vegetables, and — often — eggs, all simmered together and served atop a generous portion of white rice. But whereas donburi usually consist of traditional ingredient combinations — chicken-and-egg or marinated-beef-and-onion, for instance — B-Dama’s rice bowls will be strictly their own creations, incorporating traditional Japanese elements but also, in some cases, American, Chinese, and even Italian influences. One of the combinations the three chefs have come up with is a rice bowl that includes gravy-soaked Japanese hamburger steak, cooked vegetables, a salad, and a poached egg — kind of a Japanese twist on Hawaiian loco moco. Other bowls might feature tonkatsu (fried breaded pork) or shogayaki (ginger pork) or the Japanese version of mapo tofu. Yet another bowl will bear some resemblance to Korean bibimbap. On any given day, there will be four or five different basic rice bowls priced at around $10, and diners will be able to customize each one with various add-ons. 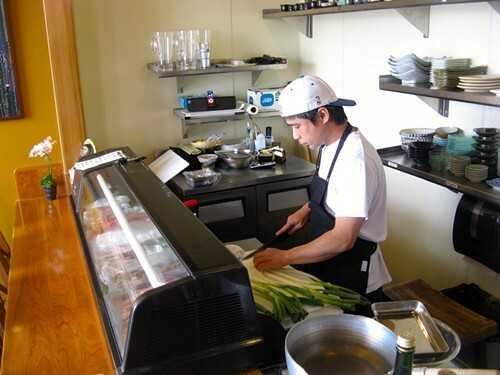 Chef Chikara Ono, at work at B-Dama. Part of the idea is to test out these recipes and gauge customer response, Ono explained. If, in fact, the rice bowls turn out to be a hit, it’s likely that tweaked versions will have a prominent place on the menu at the new Old Oakland restaurant, which will serve both lunch and dinner, with an overall focus on Japanese street food. The rice bowls would likely be just one component. In terms of the project's nitty-gritty details, Ono told What the Fork that he’s building a 600-square-foot kitchen and cafe counter in an empty space inside Swan’s Market, which is located at the intersection 9th and Washington streets. Ono’s restaurant will sit directly across from Cosecha (907 Washington St.) in the food hall, and it will share the building’s large, luxe-cafeteria-style communal dining area with Cosecha and fellow newcomer The Cook and Her Farmer, forming a kind of gourmet food court. The exact timeline for the restaurant remains unclear, but Ono said he’s applied to the city for all of his permits and hopes to begin construction by the end of the month. If all goes well, the restaurant might open sometime in December. In the meantime, lunch service at B-Dama will run from 11:30 a.m. to 2 p.m., Wednesday through Saturday.